At Christ UMC, Lehigh Acres, this year’s yuletide gift to the community will be “One Starry Night,” a live re-enactment of the Christmas story. But, as with dozens of United Methodist congregations in the Florida Conference staging commemorations of Jesus’ birth, that one starry night will take many more days and lots of donated labor to pull off. Baby Jesus, portrayed by Kahless Leotti, receives a visit from a shepherd at the inaugural "One Starry Night" live Christmas event staged last year by Christ UMC, Lehigh Acres. Photo from Christ UMC. Last year, the first time Christ UMC offered a pageant, nothing too elaborate was staged. Classrooms stood in for the town of Bethlehem. This year, however, the event is growing and moving outdoors, with a marketplace, a stable, a wise men’s tent and a shepherd’s field. The front steps of the church sanctuary will be the entrance to Herod's Palace. Stuffed and wooden animals are likely to be replaced with the real deal. "We are really sprawling this year," says Charlene Golden, the church's office administrator. "They are trying to work with a local farmer to get some live animals." 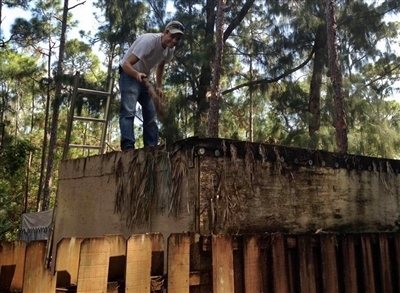 Whether it’s Christ UMC’s nearly new effort, or the 10th year of “Back to Bethlehem” at Community of Hope, Loxahatchee, or the 28th staging of “The Living Christmas Story” at Killearn UMC, Tallahassee, volunteers make everything happen. Does your church offer a live Christmas event to the community? Tell us about it in the comment section at the end of this story. In October, Christ UMC put out a call for new recruits to round out its nearly 100-member volunteer staff. Needed were a craft leader and two helpers for the wise men's tent, two shepherds and a story reader for the shepherds’ field, King Herod, four centurions, four volunteers to help guests make money bags, guides to direct people to the entrance and four volunteers to help at the children's craft booth in the marketplace. A prop team builds the stable, makes faux animals as needed, crafts items for the marketplace booths and constructs King Herod's throne. 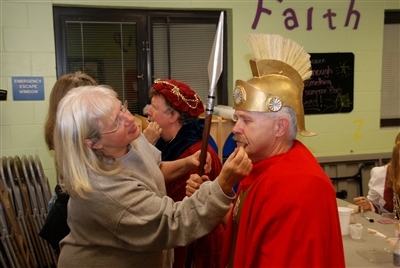 Sherri Taylor, a volunteer at Killearn UMC, Tallahassee, applies makeup to Ken Tomblin as he prepares to portray a Roman soldier in the church's annual "Living Christmas" drive-through event. Below, Bethlehem, the result of weeks of hard work, awaits drive-through guests at the church. Photos from Killearn UMC. Others sew costumes and rehearse character parts, with many of the acting roles filled by high school students from the congregation. Church members also contribute plastic coins to fill the money bags and give "shopping" money to visitors. "If you're with the church, you are working," Golden says. More than 200 people are expected to walk through the reconstructed Bethlehem at Christ UMC from 6 to 8 p.m., Dec. 12, and from 5 to 8 p.m. Dec. 13. Closer to Florida’s northern border, at Killearn, a Saturday workday and "Blue Jean Sunday" kicked off eight days of labor to build the town of Bethlehem. This drive-through event drew an estimated 7,000 people last year. Visitors follow the route in their car or climb aboard a hayride. Calls from people eager to know when Bethlehem will open often start in September. Preparations begin as early as spring and go into high gear in the weeks before the event. "After 28 years, we are known as the church that builds that Christmas thing," says event co-director Susan Moreton, who also is prayer and member care director at Killearn. "We have families who are not churched who are thrilled to bring their children here." As many as 250 volunteers, including 20 committee leaders, work on the production, which has five major scenes: the Annunciation, the shepherds on the hill, the inn where Mary and Joseph bed down in the stable, the nativity and Herod's palace. Enhancing the atmosphere will be a marketplace, women at the well, a blacksmith and fishermen. Living animals include goats, cows, calves and horses, plus two donkeys owned by the church. "We are a church of 3,000 members and two donkeys," Moreton jokes. About 150 actors perform, with another 50 or so volunteers helping behind the scenes. The first year, Killearn borrowed costumes through a connection with Warner Brothers. Since then, the church has made its own. A kitchen committee makes sure volunteers are fed. And, once the events are over, volunteers break down the sets and stash them away for the next year. "Everyone plays their part," Moreton says. This year's event will be from 6:30 to 8:30 p.m. Dec. 12-14. 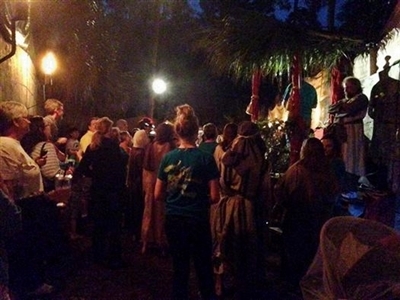 Live Christmas re-enactments often take hours of rehearsal, like the 2013 gathering, above, at Community of Hope, Loxahatchee. Below, a Community of Hope volunteer cleans a roof and decorates it with palm fronds as the church prepares to stage "Back to Bethlehem." Photos from Facebook.com/back2bethlehem. In Loxahatchee, Community of Hope is celebrating the 10th anniversary of "Back to Bethlehem" by asking guests to donate nonperishable food that will be stored in the new Community of Hope Action Center. "We'll take it to donate to hungry people," Langley says. "It's kind of an exciting year to us." The church campus sprawls across about 25 acres and reserves more than 2 wooded acres as a permanent site for Bethlehem. On a recent Saturday, about 40 people came to spruce up the landscape and clear pathways. Roofs on standing buildings were repaired and decorative palm fronds put in place. This year, a new house was built where Shabbat, the Jewish Sabbath, is observed through blessings and prayers in Hebrew. More than 150 church volunteers perform in costume; another 200 work behind the scenes or greet visitors. Last year about 8,500 guests came. The goal is to draw 10,000 this year. Drama workshops help prepare the actors. "We study this together," Langley says. "We try not to go too far with accents but ask people to stay away from slang and modern terms. Some of it is scripted, but some is ad-libbed. That's what brings Bethlehem to life. There is so much interaction." 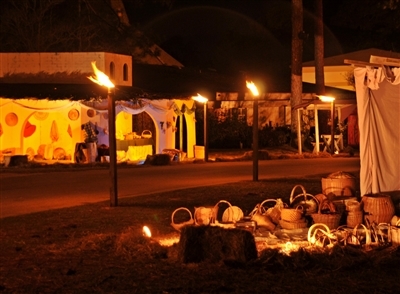 Guests can walk through the marketplace with shops typical of the time period, filled with candles, baskets and baked goods. There also is a healing place, a midwife's shop and a town square. Visitors will meet up with gossiping women at a well, a tax collector, a census taker, the town rabbi, an innkeeper, shepherds and Roman soldiers. Behind the scenes, volunteers provide fruits, vegetables, nuts and berries for actors to eat during breaks, allowing them to stay in character. Live animals will include horses, chickens, a goose, sheep and goats provided by a local petting farm. About 100 volunteers will greet visitors with gifts of hot chocolate, candy canes and popcorn. "It helps to create relationships in our church," Langley says. Community of Hope will hold its event from 7 to 9 p.m. Dec. 12-14. To see more Florida United Methodist church events this Christmas season, check out the Local Church Events page at www.flumc.org.